Roll up, roll up. The Ren Bookshelf Tour is about to commence! My favourite bookshelf is the one I have in my room. Not all of the books on it are visible in this picture because they are stacked in front of each other in some cases but I think it gives a good snapshot of me. 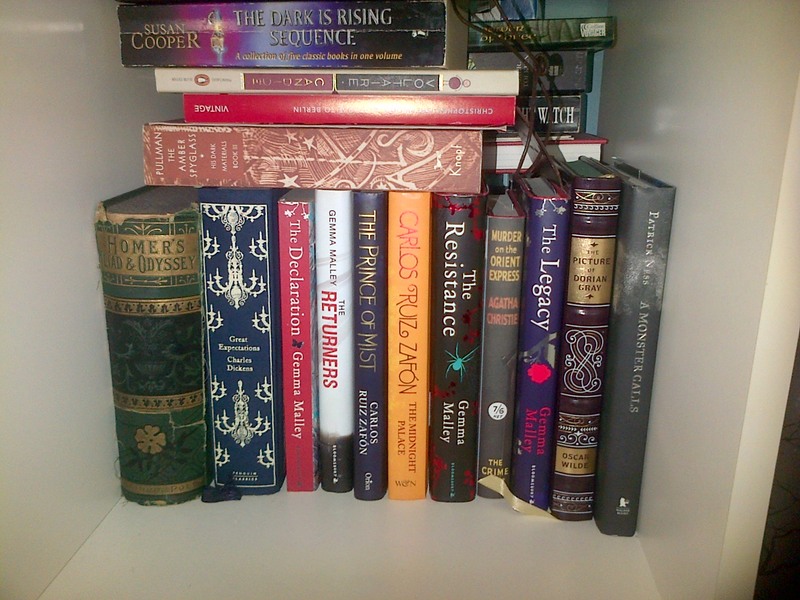 I have a mixture of manga, classics, art books, fantasy novels and many more. I also have other things, like notebooks, ornaments, money boxes and cuddly toys scattered around my shelves. My Cassandra Clare books live on top of my bookshelf. I’ve got the Infernal Devices trilogy and The Mortal Instruments series lined up behind a robot, a dark faery and her owl companion, a comparatively large black cat and fluffy fox, a knight trapped in a glass orb and a knight who’s just chilling (and silently mocking the knight who was foolish enough to get trapped in an orb. Stupid knight.). 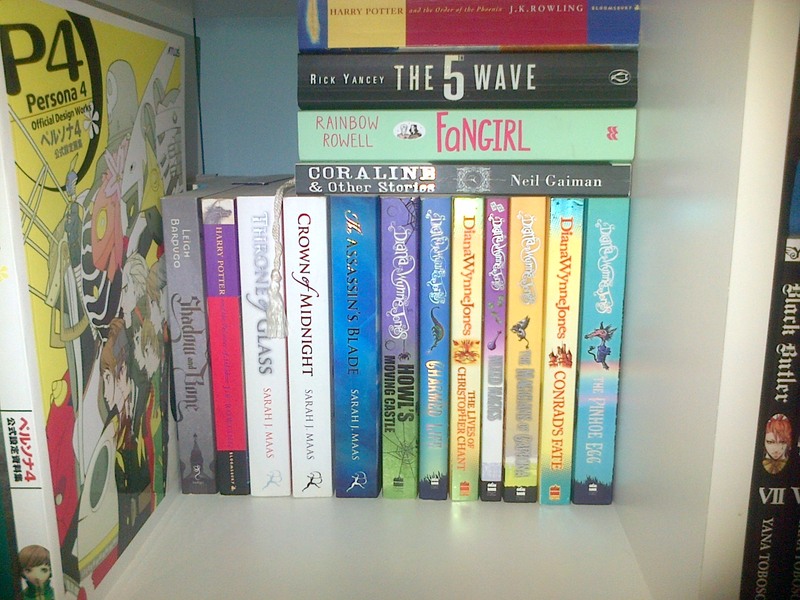 There are other books alongside my Cassandra Clare novels, most of them are manga. I have The Betrayal Knows My Name series, Darker than Black and two instalments of the manga adaptation of the Infernal Devices trilogy up there. There are also a lot of other manga volumes hanging around on my bookcase. My ever growing collection of Skip-Beat! Omnibus editions reside in the top left hand square. They are kept company by two editions of X by CLAMP. My cute little Ciel plushie guards them with his frowney face. I love my Ciel❤. Underneath his eye patch he has the mark of his contract in his eye and everything. I bought him last year when I went to Comic Con for the first time ever. In the top right hand square the manga theme continues with my lushes edition of Wolf Children. It’s so beautiful. I loved the film so much that I had to read the manga adaptation. HAD TO! To the left of Wolf Children is myNarnia collection and to the right of Wolf Children is Patrick Ness’s More Than This, Erin Morgenstern’s Night Circus and an anthology of short stories calledRags & Bones. It’s hardback mania on this shelf. A lot of small furry animals are attracted to these books. You can see them sitting protectively on top of the books. It’s like a tiny animal parade. Tigers, polar bears and dogs have united over their love of books❤. The middle two squares are packed full of manga, although there are a fair few novels lurking in the shadows behind them. The manga I have lined up include Loveless, Black Butler, Otomen, No.6 and a bit of Tegami Bachi. It’s all awesome stuff. But my favourite item on the middle shelves (apart from the cute little unicorn on the left) is my copy of Persona 4: Official Design Works. It makes me happy every time I look at it. I love art books, especially this one because you get to see how character designs developed and read some commentary from the head designers. I love having all of this extra info about how my favourite game came to exist. A close second favourite is my other art book, The Gentlemen’s Alliance Cross: Arina Tanemura Illustrations. Her art is breathtakingly beautiful. I could stare at her art all day long, seriously. It’s sumptuous. I really recommend it to fans of The Gentleman’s Alliance Cross series, or anyone who is a fan of Tanemura’s art generally. I have a lot of books by Diana Wynne Jones. I have more than is in this picture, but the others are on a different bookshelf. Diana Wynne Jones’ Chrestomanci books are my faves. My two favourite Harry Potterbooks are also hanging out on this shelf. I have this secret wish that maybe the Chrestomanci books, Howl’s Moving Castle and the Harry Potter books will somehow meld into each other and create some kind of uber universe. But I suppose if bookish-world melding was happening it might affect the whole square? A lot of British wizardry would ensue and then boom, Prince Dorian and Chaol arrive from the Throne of Glass books looking awfully confused. We’ve also got Coraline adn The Fifth Wave on this shelf. I’m thinking that if book-world melding does occur I ought to seperate these books from the others because everything would get scary and weird very quickly. Aliens and button eyes? No, thank you. At least if things did go wrong because of aCoraline/ Fifth Wave influence on this uber universe then Cath could appear from Fangirl and we could write off the whole weird experience as just a bit of fanfiction. I have Shadow and Bone by Leigh Bardugo on this shelf but I haven’t read it yet so… that would be a bit of wild card if the books melded. It’s on my TBR list, along with The Assassin’s Blade which I keep saying I want to read and then I never get round to it. 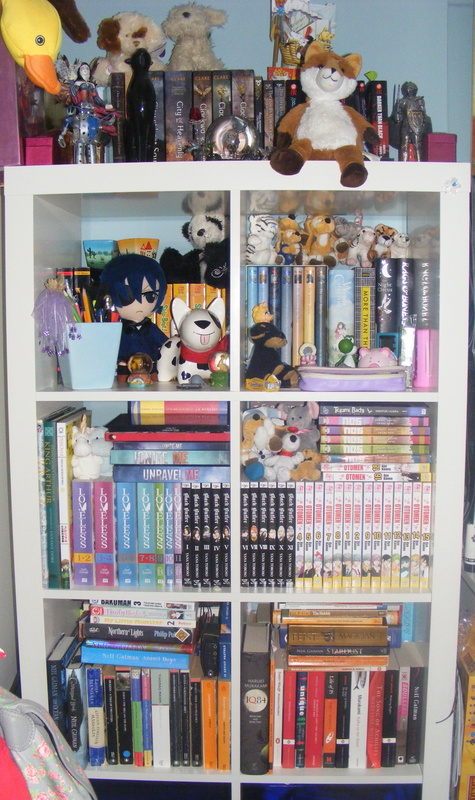 The bottom two shelves are mostly full of novels (although there is still the odd manga, including Fruits Basket, Bakuman and My Little Monster). 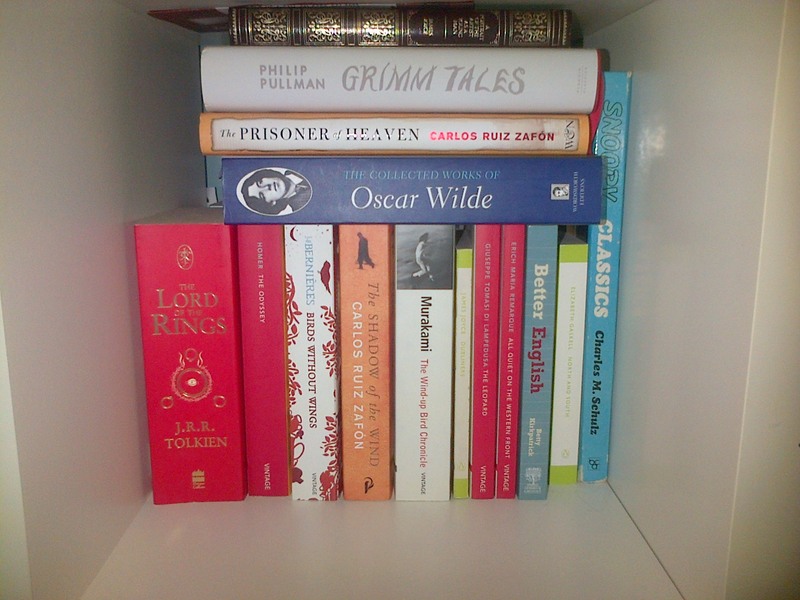 A fair few of my favourite novels by Neil Gaiman are scattered between both of my bottom sheves. My favourite Gaiman novels include (but are not limited to) The Graveyard Book, Neverwhere and The Ocean at the End of the Lane. Gaiman’s not the only favourite to reside on the bottom shelves, though. I also have The Song of Achilles by Madeline Miller down there. I can’t put my love of that book into words. You know how I talked about reading books when I should have been revising? Yeah, The Song of Achilles was one of those books. Even though I knew I should have been revising I simply could not put it down. My other favourites down there include Captain Corelli’s Mandolin, Brideshead Revisted, Magician, The Hobbit, Northern Lights and Persuasion. I LIKE ALL OF THE BOOKS. Unfortunately no fluffy animals or knights live in the bottom two squares. There is only a random pack of pastels to distract from the bookishness of those squares. Here endeth the tour of the bookshelf that lives in my bedroom.